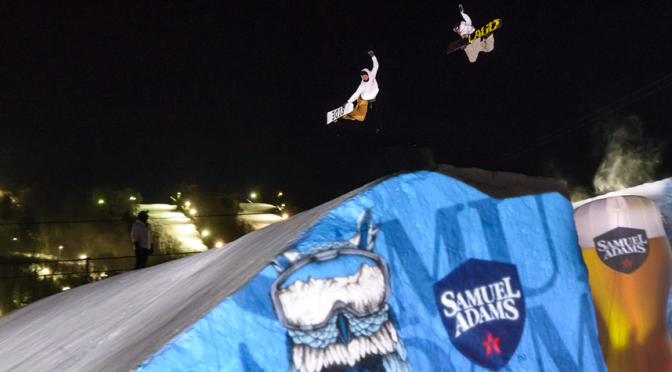 North Conway, NH – Following a first stop at Camelback Mountain Resort in Pennsylvania, the Sam Adams 3D Air & Après Show Tour’s second stop will be at Cranmore Mountain Resort in New Hampshire on March 18th. The show is set to combine high-flying action, world-class ski and snowboard athletes and Hollywood quality 3D mapping projection, creating an après ski and snowboard party you won’t want to miss. 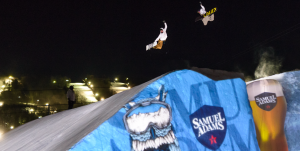 Brewer Sam Adams is combining the art of big air with high-tech 3D projection to create an on snow spectacular that has to been seen to believe. The event will feature athletes performing big air with an incredible light show and 3D graphics being projected onto the jumps. Guests attending will also find fireworks and a variety of fresh Sam Adams beers. The event kicks off at noon with a team demonstration, and the Sam Adams team will be on the snow with a photo booth, beers to sample and more. At 6:30 p.m., DJ Velar will perform and the 3D projection show begins at 7:30 p.m. Following the show will be fireworks, an athlete “meet and greet” and after party in Zip’s Pub.